Whenever the phrase “horror fiction” is brought up, the mind invariable turns to stories. But what about poetry? It too is a form of fiction and a poem could just as easily have a horror theme instead of the expected ode to nature or romance. 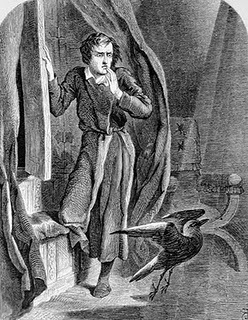 After all, one of the greatest literary works in the world of horror is Edgar Allan Poe’s poem “The Raven.” With that in mind, let’s look at some spooky poems by both well-known horror authors and lesser-known writers. Although best known for his weird tales, Clark Ashton Smith has written numerous horror-themed poems including “Medusa,” “The Eldritch Dark,” “Nightmare” and many more. Although his wife is famous for writing Frankenstein, Percy Bysshe Shelley has written some macabre works of his own. If “The Devil’s Walk” isn’t to your liking, perhaps one of his two poems about death will? You might remember Nick Mamatas from this entry about free online Cthulhu stories, which included his novel Move Under Ground. Mamatas took the various mythos-themed senryu sprinkled throughout the novel to form the chapbook Cthulhu Senryu. The Google Books preview of it offers several of these humorous, occasionally NSFW Japanese-style poems for you to enjoy. It’s probably safe to say that most of the people reading this are more familiar with Japanese haiku than they are with senryu. The Wikipedia entry for Scifaiku both defines and provides examples of this special form of haiku. Also, Ryan Mecum has written vampire, zombie and werewolf-themed haiku that you can read thanks to the free previews at Amazon.